If you listen to Tea-Publicans tell the tale, they would have you believe that the U.S.-Mexico border is unprotected and illegal immigrants are pouring across in record numbers, and that secret Muslim Kenyan Marxist Black man in the White House is doing nothing about it! Of course, what Tea-Publicans believe, because they live in the epistemic closure of the closed information feedback loop of the conservative media entertainment complex, is distorted by the fact-free world of right-wing propaganda. As the Department of Homeland Security continues to pour money into border security, evidence is emerging that illegal immigration flows have fallen to their lowest level in at least two decades. The nation’s population of illegal immigrants, which more than tripled, to 12.2 million, between 1990 and 2007, has dropped by about 1 million, according to demographers at the Pew Research Center. A key — but largely overlooked — sign of these ebbing flows is the changing makeup of the undocumented population. Until recent years, illegal immigrants tended to be young men streaming across the Southern border in pursuit of work. But demographic data show that the typical illegal immigrant now is much more likely someone who is 35 or older and has lived in the United States for a decade or more. Homeland security officials in the Obama and George W. Bush administrations — who have more than doubled the Border Patrol’s size and spent billions on drones, sensors and other technology at the border — say enhanced security is driving the new trends. The issue of border security is central to the broader debate over immigration reform that has roiled Washington in recent years and is emerging as a flash point in the 2016 presidential campaign. Congressional Republicans have insisted on greater border security before they consider legalizing any immigrants who came to this country without proper documents. President Obama says the border has never been more secure and is urging a series of legislative steps to legalize millions of undocumented immigrants, streamline the visa system and further fortify the border. What’s increasingly clear is that the shifting fortunes of the U.S. economy account for less of the ebb and flow of illegal immigration. Even as the economy bounces back from recession, illegal immigration flows, especially from Mexico, have kept declining, ­according to researchers and government data. Since the 1990s, the opposite was true: The better the economy, the more people tried to come. “Every month or quarter that the economy continues to improve and unauthorized immigration doesn’t pick up supports the theory that border security is a bigger factor, and it’s less about the economy and we have moved into a new era,’’ said Marc Rosenblum, deputy director of the U.S. immigration program at the Migration Policy Institute. Some researchers say factors other than security are playing a role and might even account for much of the reduced flow of illegal immigrants. These researchers point, for instance, to changes in Latin America that could be pushing fewer people to seek a better life in the United States. At odds with the government’s claims of success, a series of academic studies in recent years have found little linkage between border security and illegal migration. Douglas S. Massey, a Princeton University sociologist, said the falling numbers of immigrants have “nothing to do with border enforcement.” Massey, who helps run a project that has interviewed thousands of illegal Mexican migrants over the past three decades, attributed the trend to demographic changes in Mexico, such as women having fewer children. But even some researchers who are skeptical about the overall effectiveness of enhanced border security acknowledge indirect effects of these measures. 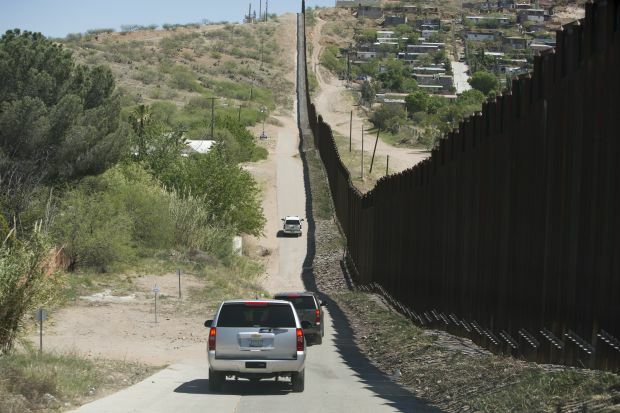 Since the Bush administration, the DHS has dramatically increased its efforts to lock down the southwest border. The budget for Customs and Border Protection has grown to $10.7 billion in the past decade, a 75 percent increase. The number of Border Patrol agents at the border has nearly doubled over the past decade, to more than 18,000 today. Much of the ramp-up occurred during the Bush administration, but the Obama administration has marshaled more forces as well. Homeland Security Secretary Jeh Johnson has recently set up three task forces to increase coordination within the DHS. Current and former DHS officials acknowledge that a confluence of factors explains the decline in illegal migration, including demographic changes in Mexico, improvements in its economy and Mexico’s crackdown on Central American migrants headed to the United States. But these officials insist that the massive investment to secure the border has been the key factor. In 2000, considered the peak of the flood of illegal Mexican migration, more than 1.6 million people were apprehended, according to DHS data. Those numbers have plunged to around 400,000 per year since 2012 and are down 28 percent in the first part of fiscal 2015 compared with last year. Even last year’s widely publicized spike in unaccompanied minors crossing the border from El Salvador, Guatemala and Honduras has receded dramatically, the data show. While the declining number of apprehensions is not conclusive proof that illegal immigration is down, other less publicized research strongly suggests this is the case. Wayne Cornelius, director of the Mexican migration field research program at the University of California at San Diego, interviews hundreds of people each year in the Mexican state of Yuca­tan and asks them whether they are planning to come to the United States in the next 12 months. In 2006, 24 percent said yes. By 2009, as the U.S. economy was cratering, 8 percent said yes. This year, 2.5 percent answered in the affirmative. A recent study by the Pew Research Center, meanwhile, found that the median length of stay for illegal immigrants in the United States jumped from less than eight years in 2003 to nearly 13 years by 2013. Their median age has increased from 28 during the 1990s to nearly 36 today. Those figures wouldn’t be possible if young men were still coming across the border in huge numbers, and it was those young men who accounted for most of the illegal traffic. But Massey, the Princeton researcher, highlighted an unintended consequence of the security crackdown on the border. He said immigrants who are already in the United States are afraid to go back and forth to Mexico as they traditionally did, and are “aging in place” in the United States. According to estimates by the Migration Policy Institute, about a third of illegal immigrants own a home and have children who are U.S. citizens. The media always wants to focus on people crossing the U.S.-Mexico border, as if our more expansive border with Canada does not exist. People enter this country every day through airports and seaports, or drive across from Canada and Mexico. They come from every country in the world. Many enter the country legally on a visa. They become illegal immigrants only when they overstay their visa. Forty percent of illegal immigrants, he said, initially entered the country legally with a visa — underscoring the need for better tracking of foreign nationals who come to the U.S. as tourists, workers or students. We rate this statement TRUE. While the data Bush and many others cite for the 40 percent figure was compiled almost a decade ago, no data that are more recent refute the claim, and a leading researcher in the field told The Des Moines Register that the percentage remains accurate. The assertion that 40 percent of undocumented immigrants are people who have overstayed visas has been repeated far and wide over the past several years — showing up in lawmakers’ speeches and interviews, congressional transcripts, news stories and elsewhere. It’s generally traced to a 2006 report published by the Pew Research Center. That May 22, 2006, Pew fact sheet actually contains several figures encompassing a wide range of estimates for the percentage of undocumented migrants who entered legally with visas. For data current as of 2005, Pew estimates 41 percent of undocumented immigrants living in the U.S. had overstayed a visa. For data current as of 2006, the report offers a wider range: between 33 percent and 50 percent. The challenge with all these data points is their age. The most recent is going on 10 years old, and there do not appear to be any newer published studies. But Robert Warren, the former director of the statistics division at the INS and currently a visiting senior fellow at the nonpartisan Center for Migration Studies, says he believes the proportion of overstays remains about 40 percent — and he’s in a position to know. Warren authored that 1997 INS report, and his methodology for calculating overstays has been followed by every subsequent study. He continues to produce scholarship in the field, including a paper published earlier this year that analyzes year-by-year data on undocumented immigration. Following an interview with the Register, Warren offered a back-of-the-envelope calculation of overstays as a percentage of the undocumented immigrant population based on 2013 population estimates and came up with 41 percent. First of all, no one has studied visa overstays since 2005? Seriously? Secondly, if you want to maximize the return on the money we invest on interdicting illegal immigration, wouldn’t it make far better sense to more closely monitor people who are here on a visa and to send them back home when their visa expires? A 40 percent reduction! C’mon! It would be a helluva lot cheaper than all the electronic surveillance, aerostat blimps and drones, and a militarized border with a double wall and flaming moat with asbestos alligators with laser beams that Tea-Publicans are demanding. And what about the Canadian border? I lived in Minnesota. Those sneaky bastards look and sound just like us! Why do Tea-Publicans never freak out about white Canucks illegally immigrating across the Canadian border? Oh that’s right, it’s because they are not brown. The tea baggers will say that must mean it is at a twenty year high!